True SCR Control without the wiring Hassel! Fused with fast acting Safety Fuse. 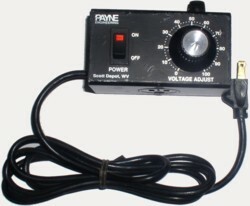 120 or 240 Volt Single Phase. SCR's: Model 18TP Controllers provide infinitely variable control of single-phase AC Voltage to, resistive heating elements. 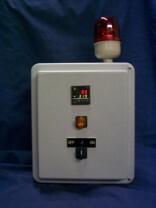 These Controls are Solid-state replacement for variable transformers, and electrical mechanical contactors. Power Triacs replace Contacts and brushes to control electric power without moving parts. If operated within the stated rating for current, voltage and temperature should run for millions and millions of cycles without failure and have no known MTBF or Life expectancy rating. Click here for the Online Bulletin! protection from chemicals and dust. Contact voltage drop "1 to 1.6 volts"